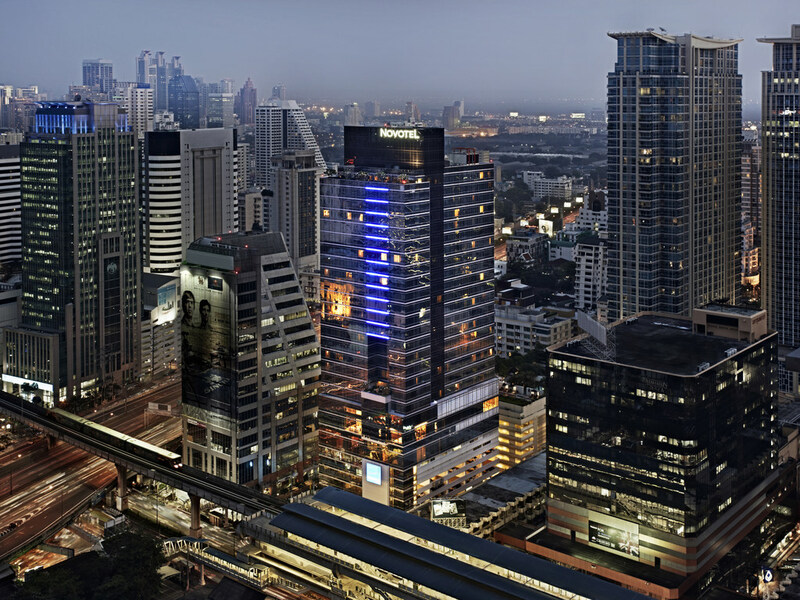 Welcome to Bangkok, a city filled with excitement to explore night and day. Please feel free to contact our team anywhere, anytime to make you feel like home. Your smile is our pride. Located next to Ploenchit sky train station, offering easy access to Bangkok CBD including Silom, Sathorn and Sukhumvit. Shopping malls, restaurants and spas are within walking distance or easily accessed via sky train. Local restaurants, bars and spas are within walking distance or easily accessed via sky train. Nearby attractions include Jim Thompson House, Sea Life Bangkok, Erawan Shrine (Four Faced Buddha) as well as the riverside and temples tour. 370 accommodation rooms at Novotel Bangkok Ploenchit Sukhumvit comprising Superior, Deluxe, Premier, Junior Suite and Suite room. Every room features fantastic city view, a daylight window, a daybed, a rain shower and free WIFI. This all-day-dining restaurant serves breakfast, lunch and dinner, features both buffet and a la carte menus. Further from Asian, European, Indian and Thai dishes, The SQUARE also caters for special menus including vegetarian and non-pork dishes. A lobby bar plus relaxing outdoor seating area, Dee Lounge & Beer Garden offers drinks, snacks, pastries and a la carte menus throughout the day. Also features live music in the evening. Happy Hours from 4 to 7 PM everyday. This is a Fantastic Property for business travelers! The entire team of the Premier Lounge: Na, Tik, Bim, Kiki and Fern were amazing hosts who took great care of me! Thank you once again! Will definitely return and recommend! I love this hotel for it's location. It's just next to the BTS. The room is of a comfortable size and housekeeping is very responsive. Like when I told them that the air con was not working very well during the night they immediately send someone to check and rectify it. Very comfortable and enjoyably stay at this hotel. Our premier room on the 29th floor was very clean and roomy with a good view. The view from the lounge is exceptional and the beverage and food is good during happy hours. The location of the hotel is just at the sky train station so very easy access and easy to move around in Bangkok. The staff was very helpful and check in, check out in the lounge was smooth and easy. Stayed weekend + 2 working days. MTR station next to hotel makes it easy to move around. Rooms were reasonable size, amentities good and sound isolation good. Hotel has a very nice rooftop bar, quiet and cozy atmosphere. Restaurant seafood buffet was good value for money and choice large. First floor bar has good snacks and food, the beer garden outside very noisy due passing street. Nearly impossible to speak during rush hours, some kind of noise wall would be needed. It was voting weekend so no live music this time on Saturday evening. Breakfast is good, all choices. For some reason, for both times I have been there, the check-in is pretty slow, even for Accord Club members, although we had checked-in on line. I have book for one day in advance so when we will reach the place the room suppose to be ready but it was not and we wait for almost 3 hours more in order to get the room ready even if we pay for one night before. The first time the upgrade from King to suite put us on 17th floor instead of executive floor. The lower the floor, the more disturbance from the band playing in the Beer garden. No usual letter of welcome from the GM, No fruit. Despite two requests to housekeeping, the requested English Breakfast tea was ignored. The Executive lounge staff also seemed more interested in chatting than in seeing to the comfort of their guests so we had to seek them out to request beverages and replenishment of breakfast buffet items. The checkin staff is so so, did show any appreciated manners, only trying to offer upgrading the rooms and stuff. Im a silver member and my gf too but they didn’t treat us as we expected like other AccorHotels, totally disappointed. Lacking of room amenities, staff’s problem’s solving ain’t consistent. House keeping did their good job to be fair. Lobby staff is haizzz! Very convenient hotel just in-front of BTS. The hotel management was very kind for upgrading my room. This has always been our favourite hotel whenever we go to Bangkok. The room is very comfortable and good clean, room at high floor has very good view of the city and one can go to roof garden to take photos of the city. The check-in / out staff was superb courteous especially the staff from the Premier Lounge. One can take the BTS train easily to train to Siam Square, Terminal 21 for shopping and for food. One can walk under shelter all the way from the hotel to Siam Paragon, Central world, Pratunam. The Hotel breakfast was very good and sumptuous with good variety especially the fresh juices. Location & service at this hotel is indeed pleasant with real warmth felt from some of its staff. The breakfast buffet was great and too generous. I had problem sometimes with the WiFi internet service which was unexpected. A very well maintained hotel that is both clean and comfortable. You cannot get more convenience with BTS right in front of the hotel that is only 2 stops from Siam. Pool is nice but the sauna is an added bonus not many hotels have. Was given a very nice corner room on 23rd floor with a good view of Bangkok. As a member, the complimentary late check out on Sunday is much appreciated. The staff were all very friendly and competent! Maybe the bed and pillow can be improved if there is something I would like to see in my return stay. An excellent hotel with wRm welcoming stay who couldn’t do enough for you. I was here for business and delivering training in one of the excellent meeting rooms on the 9th floor. Staff were helpful and attentive in the meeting rooms and so very helpful when I.T problems arose. Food and refreshements throughout the stay was first class. Overall a great experience and I’m looking forward to coming back again soon. checking in and checking out was very smooth and quick. customer service at all points of interaction were on point! Check in in the Lounge accompanied by the the Lady of the house Claire and she explained the newly decorated terrace of the lounge. Wonderful idea, hats off!! This particular room is somehow noisy, having regular crickling sound, but not sure where the sound from. And disturb my sleep. the location of the hotel is very good. almost all the taxi drivers know where is the hotel. the room is clean and tidy. there is one thing that I think the room need is a time. its kinda hard for me to know the time everytime I woke up without a clock.